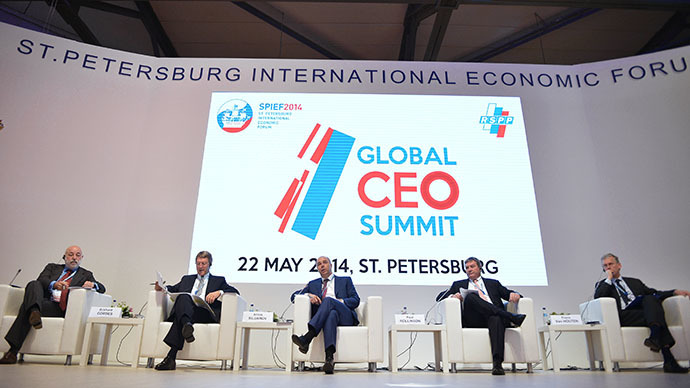 The 18th International Economic Forum in St. Petersburg has kicked off and runs May 22-24. Thousands of business leaders, policy makers, and economic experts have gathered to talk business, leaving politics at the door. This year's theme is ‘Sustaining Confidence in a World Undergoing Transformation’. The three day forum will feature a variety of prominent names across all industries and will feature the ‘CEO Global Summit’, which will focus on how to work together in addressing worldwide economic challenges. Sessions on realizing Russia’s competitive advantage will also be a main pillar of the forum. Over 6,500 guests, 609 heads of major Russian and non-Russian corporations, and 1,700 journalists are participating in SPIEF 2014, taking place from May 22-24. Delegations from 75 countries are at the forum. 18:28 MSK: Putin wraps up his interview with the international press and says it’s time for dinner, bringing this year's St. Petersburg Economic Forum to a close. 18:02 MSK: Putin suggests that the leaders in Brussels are deliberately blocking Belarus and Kazakhstan from the WTO. They believe the Eurasian Customs Union will stay more competitive, an approach that is focused on disadvantages instead of advantages. 17:50 MSK:“Sanctions will lead the global economy to turbulence, which is in no one’s interest,” Putin said. 17:48 MSK: “It’s not possible to isolate a country like Russia,” the president said. 17:40 MSK: Putin has reiterated his stance that economic sanctions against Russia are “totally counter-productive” and are a violation of international law. 17:25 MSK: Putin said he fears turmoil in Ukraine could threaten the security of gas pipelines. 17:08 MSK: The second pipeline to China will be cheaper than the first because Russia will use some existing pipeline infrastructure, Russian President Putin said. 16:56 MSK: President Putin fields question from the media at the St. Petersburg Economic Forum.Watch here. 16:40 MSK: Sechin says the most important event in 2014 both for global industry and consumer markets will be work it does with Exxon in the Karsk Sea to develop reserves in the Arctic. 16:28 MSK: There is discussion among Russia’s finance and economic development ministers to decrease the state-held stake in Rosneft by 19.5 percent in the coming years. Sechin believes selling a controlling stake could harm stakeholders. 16:25 MSK: Russia will build energy facilities in Iran with up to 6,000 megawatts of power output, Russian Energy Minister Aleksandr Novak said. 15:41 MSK: BP CEO Bob Dudley delivers a statement to the energy panel. Relationships with Russia and Rosneft are not “transactional” but are “strategic partnerships based on mutual benefit,” Dudley said. 15:35 MSK: General Electric (GE) is working on efficiencies of LNG trains, President of GE’s gas division. 15:32 MSK: Rosneft CEO Igor Sechin says he was very surprised by the sanctions, but he prefers not to waste time discussing the topic. "To participate in discussion of sanctions is counterproductive because they realize the level of their significance,” Sechin said. “The threats that have been expressed are not threats at all,” he added. 15:18 MSK: ExxonMobil’s president says there are three main priorities in energy cooperation with Rosneft- deep-water exploration, ‘unconventionals’ such as ‘tight oil’, and the Arctic. 15:17 MSK: Energy use will rise by 35 percent by 2020, by ExxonMobil’s estimate. 15:10 MSK: Rosneft plans to continue the purchase of Morgan Stanley’s oil trading business. #SPIEF2014#Rosneft#Sechin wants change in tax regime for hydrocarbon industry. 13:00 MSK: Sechin sees world oil prices growing 2-3 percent per year. Despite the financial crisis, demand worldwide continues to grow. 12:53 MSK: Rosneft will send 55 billion tons of gas to China by 2020. 14:46 MSK: Exporters, and not just importers, need to have their interests reflected, Sechin says, echoing Putin’s message that some types of regulation can have unfair market interference. 14:44 MSK:“Energy is the food for the modern economy,” the moderator, Ichiyo Ishkawa from NHK Japan Broadcasting Corporation, said in his opening comments. “Regulation sometimes distorts market signals and leads to unjustified subsidizing of all types of energy. In the EU these are the renewables. This market distortion damages the competitive environment and competitive capacity of whole industries,” Putin said. 14:30 MSK: The Energy Summit has begun and Putin addresses the audience. Watch live here. -BP to jointly explore hard-to-recover oil in the Domanic formation in the Volga-Ural region in central Russia. Rosneft will hold a 51 percent share, and BP will control 49 percent. -Abu-Dhabi-based Mubadala Petroleum to study cooperation projects in Eastern Siberia, East Asia, and Southeast Africa. - CubaPetroleo cooperation to implement offshore projects in Cuba, which the country estimates at 20 billion barrels of oil, but the US Geological Survey believes is less, maybe 4-9 billion barrels. 14:00 MSK: Putin visited St. Isaac’s Cathedral in St. Petersburg to celebrate the Day of Slavic Written Language and Culture, a holiday that honors the Slavic alphabet and its authors, Saints Kirill and Methodius. 13:20 MSK: Russian President Vladimir Putin holds a working meeting with heads of energy companies. “We do not divide up our partners on the basis of nationality. You are all members of one family,” the Russian president said. 12:57 MSK:“Even at this stage what we see is further stumbling block for businesses that are not already invested in Russia to come and invest here. To restore that position, we have to find ways to restore trust quickly,” Roger Munnings, Chairman of the Russo-British Chamber of Commerce, said. 12:55 MSK:“Naturally British companies who are not invested here feel they must take great care of about the sort business they imitate and do in Russia at the moment. I think this is inevitable in all countries in the EU, Canada and the US,” Munnings said. 12:35 MSK:“Why are there so few Western construction companies in Russia with such a huge market. It’s very simple: to set up a successful business in Russia, you need time,” Alberto Conta, vice-president of Codest International, an Italian construction group that has been operating in Russia and CIS for 30 years. 12:30 MSK: “I have been here for almost 15 years, and I have lived through several US-Russian geopolitical conflicts. The history of those have shown that in a reasonable amount of time, things are restored to normal, and business can go back to doing business and I am very confident and hopeful in this situation,” Andrew Somers, former president of the American Chamber of Commerce in Russia, said at the panel. 12:20 MSK: The most favorable regions for German companies to work in are Kaluga, Tatarstan, and Ulyanovsk, according to the Russian-German Chairman of the Chamber of Commerce. 12:16 MSK: Sanctions could ruin relationship between Russian and German companies. German companies supply products and services of $45 billion to Russia. Over 6,000 German companies work in Moscow, and the number for all of Russia is even larger. “Angela Merkel is not the biggest fan of sanctions,” Michael Harms, chairman of the Russian-German Chamber of Commerce said. “99 percent of all business deals are done without any political influence, and thank God for that,” Harms said. 12:10 MSK: Foreign company heads discuss how to thrive in the Russian business climate. 11:09 MSK: Cai Guiru, chairperson of the Chamber of Commerce in Russia, reported on Russia-China customs relations. In April 2014, customs authorities of Russia and China create the so-called ‘Green Corridor’, a customs channel that facilitates and simplifies customs clearance procedures between the two countries. Russia and China will work together to develop Far Eastern regions in Russia alongside 10 provinces in northeastern China that share a border with Russia, with the eventual goal of developing a large East Asian economic bloc. - Gas deliveries to reach 30 million metric tons by 2018. In Q1 gas supplies from Russia to China were 15.75 million metric tons. - Electricity. Russia supplied 3.9 kw/h to China in 2013, expected to grow to 6 billion kw/h. 10:49 MSK: Panelists discuss the importance of setting up a Russian national payment system, as well as setting trade between the two countries in rubles and dollars. This will help reduce costs and expenses. 10:38 MSK:“Indeed the trade and economic and investment between our countries has been developing dynamically over the past several years, however today it is entering a more proactive stage of growth,” Boris Titov, Russia’s presidential commissioner for entrepreneurs rights protection said. 10:28 MSK:“The Chinese investment company is one of the largest in the world. We have accumulated several billion dollars of investments in Russia in such spheres as finance, agriculture, real estate, and others,” Ding Хuedong, Chairman and CEO of China Investment Cooperation said. The China-Russia fund has been active for two years, and investment is set to continue expanding into high-tech and pharmaceuticals. “Russia has the potential to become the world’s largest exporter of agricultural goods,” Хuedong said. 10:06 MSK:“Our cooperation is at the peak of its development,” Russia’s Deputy Economic Development Minister Aleksey Likhachev said. 10:04 MSK: The Russia-China Strategic Economic Partnership business roundtable has started. This is the first time in Forum history that a panel has been dedicated to Russian-Chinese cooperation. Watch here. 9:00 MSK: Some are up bright and early to attend today’s first panel, a business breakfast on Russia’s IT sector. 8:30 MST: RT is back with live updates from the St. Petersburg International Economic Forum. Today's Business Roundtable at 10:00 MSK will focus on Russia and China’s blooming economic ties, and at 14:30 Igor Sechin, CEO of Rosneft, will deliver a keynote address at the Energy Club Summit. 19.00 MSK: Asian Times correspondent Pepe Escobar gave his impression of President’s Putin speech to RT. “It was a geopolitical equivalent of a ‘rock superstar’ addressing an audience,” he said. According to Escobar, there were three key messages Mr Putin clearly delivered. First, the sanctions are unlawful and illegal. Second, he’s going to respect whatever happens in the Ukrainian elections this Sunday. And third, by arranging a “surprise speech” by Chinese Vice President Li Yuanchao, the Russian President sent a message that Eurasian integration is being enacted. 18:44 MSK: Talking about sanctions, bosses of the Association of European Businesses and Deloitte tell RTthey hope policymakers will soon find a reasonable solution to the ongoing crisis. “Why are we being taken hostage by irresponsible, I must say, political decisions,” Reiner Hartman, Chairman at the Association of European Businesses, said. RT talked with Total CEO Christophe de Margerie, Sun Group CEO Shiv Khemka, Deloitte Managing Partner David Owen, and the Association of European Businesses’ Reiner Hartman at SPIEF. #SPIEF2014: Russian Fin. Min. #Siluanov: "Financing Crimea should not lead to less financing for other regions." 18:10 MSK: Putin's spokesman has confirmed the President will attend the BRICS summit in Brazil this July. 18:00 MSK: Today at the forum Novatek, Russia’s largest independent gas produce agreed to sell 3 million tons of liquefied natural gas per year to GMT, Gazprom’s trading unit. The gas will come from the Yamal LNG plant, which is a $27 billion project in cooperation with France’s Total and China’s CNPC. 17:50 MSK:“The Russians have a big advantage because they are liked in India, all over Africa, the Soviet legacy has created a huge legacy of goodwill that needs to be tapped,” India's Sun Group CEO Shiv Vikram Khemka said. “The training that Russian companies got in the early 90s and 2000’s, has made them good at working in emerging markets, because it was very tough training on their home ground, so when they go to other markets they recognize things,” Khemka said. Kemka added Russia’s strengths are also weaknesses- they aren’t able to move fast enough. 17:42 MSK:“We are a state cooperation, we don’t compete with private banks. Should a private bank come up with a good business plan, our bank will not interfere. We have different priorities, we serve different goals,” said Andrey Sapelin, Chairman at Russia’ foreign development bank Vnesheconombank (VEB). 17:37 MSK:“We are here to support small and medium-sized business. The backbone of developed economies and making them successful in the long-run is supporting economic growth, employment, and welfare,” Pieter Boone, Managing Director of METRO Cash & Carry Russia, the self-service wholesaler founded in Germany. 17:30 MSK: Moscow mayor Sergey Sobyanin makes an appearance at the Forum. 17:01 MSK: Russia’s largest car-maker, AvtoVAZ will drop its offshore status and re-register in Russia. The announcement was made by Sergey Chemezov, the head of state-run Rostec. The technology corporation holds a stake in AvtoVAZ. 16:48 MSK: Sun Group CEO Shiv Vikram Khemka sees a collaborative future for Russia, China, and India. 16:40 MSK: Putin said the government doesn't plan on shutting down any social media sites. 16:22 MSK: Li Yuanchao, Vice President of the People's Republic of China, takes the stage. Russian and Chinese relations have “reached a whole new level” said Chao. 16:15 MSK: Fossil fuels alone will not ensure positive growth rates, Russia needs structural changes, Putin said, referencing the 8 point economic plan he delivered earlier in the day. 16:08 MSK:“Europe is our single most important trading partner, and we’d like to keep it that way,” Putin said. Trade between Russia and the EU is $440 billion, trade between Russia and the US is $27.7 billion. 16:02 MSK: Putin says that sanctions are unlawful, unfair, and illegitimate. Putin asks what will be the pretext for the next round of sanctions? Jokes whether Russia can be sanctioned over unrest in Thailand. 15:46 MSK:“Where is the money? $3.5 billion, that’s how much they owe us. That would be a big prerequisite for future relations with Ukraine,” Putin said. 15:38 MSK:“Ukraine staged a coup, they don’t want to talk to us. No dialogue has taken place with us," the President said. 15:35 MSK: Rosneft signed a 6-year contract with EuroChem to supply 9.82 billion cubic meters of gas to the Russian chemical and fertilizer company. 15:26 MSK: Putin stressed the need to replace imports with domestically produced goods. “Without violating WTO rules, we will be able to reduce our imports and reclaim markets for domestic manufactures – in high-tech, programming, textiles, and food production,” Putin said. 15:10 MSK:“We would like to establish Russia-China energy alliance which would be and pillar for the entire region,” Putin said. 15:07 MSK:“Shift to Asia-Pacific is more than rational, especially with our plans to develop Siberia and the Far East,” Putin said. “There are some barriers to indulgence, some things we cannot afford,” the President said. 15:04: Putin spoke on Ukraine and its debts to Russia. “We all know who is to blame - the transit country, Ukraine has abused its position. Ukraine insists on benefits it is not entitled to," Putin said. Despite the shaky relations, the Russian President said he is willing to negotiate with Ukraine over gas. 15:02 MSK:“We’ve seen a reluctance to welcome new leaders of the global economy,” Putin said, adding that the unilateral economy has failed. 15:01 MSK: Putin emphasized that one of the most important events of this year will be on May 29 when Russia, Belarus, and Kazakhstan sign off on the Eurasian Customs Union, which will come into effect on January 1, 2015. Armenia and Kyrgyzstan may both be brought into the free trade zone comprising over 170 million people. 14:55 MSK: Putin gives the official opening words of the Forum. 14:44 MSK: Putin on Gazprom-China gas deal: Russia has enough resources for 50 years. Check out the story here. 14:16 MSK:“We at BCG believe that with increased competition and openness, Russia in the next 10 years will move to another level of performance,“ Hans-Paul Burkner, Chairman of The Boston Consulting Group, told the President. 14: 13 MSK: Putin addresses the Russian Central Bank’s effort to clean up the banking system, getting rid of banks that have bad credit or shady practices. Russia has 950 banks. Putin said it’s “very painful” to close down banks, but necessary. 14:08 MSK:“Hydrocarbons aren’t getting any cheaper. Reservesare of course huge, but they are either difficult to recover or located in remote areas. Of course there are advantages and disadvantages,” Russian President Vladimir Putin said. 14:05 MSK: Russian plans to switch its energy mix and aims to have nuclear energy making up 25 percent of the energy basket. By comparison, in France, nuclear energy comprises 90 percent. 13:44 MSK: Russian President Putin arrived and will answer questions from the Global CEO Summit group. 13:25 MSK: Russian President Putin present the International Global Award soon. Watch here. 13:00 MSK: VTB doesn’t plan to close down subsidiary businesses in Ukraine but doesn’t plan to expand in the country either, President and Chairman of VTB Bank said. 12:55 MSK: Lukoil and Total SA signed a joint venture agreement to develop shale hydrocarbons in the Bazhenov reserves in Siberia. Lukoil will own 51 percent of the project, and the French will control 49 percent. 12:45 MSK: Central Bank head Elvira Nabiullina confirms Ulyukaev’s estimate from yesterday that capital outflow from Russia in 2014 will be between $85-90 billion. The last previous official estimate by the Central Bank was $20 billion. 12:30 MSK: The creation of the Eurasian Union is a strategic goal of Russia, says First Deputy Prime Minister Igor Shuvalov. 12:14 MSK: Russia's Finance Minister Visa and MasterCard will continue work in Russia. “They have appealed with a proposal that in the next sixth months they would find a way to establish a system to work with Russian payment systems. In the next year and a half they would create Russian Visa and MasterCard companies,” says Russian Finance Minister Anton Siluanov. 12:01 MSK: Russian Railways head Vladimir Yakunin tells CNBC that the sanctions are "undiplomatic" and "like a quarrel in the kitchen." 11:30 MSK: Visa and Mastercard have come to an agreement with Russian authorities on the conditions of working in Russia, ITAR-TAS reports. “Gas isn’t winning in Europe because it’s too expensive and second because it doesn’t relate to the realities of our customers,” Birnbaum said. "The reality is from a demand standpoint, prices in Europe are too high to trigger more demand,” Birnbaum said. 10:48 MSK:“To appreciate the scale: in one day, in terms of consumption, China has become equal to Gazprom’s largest consumer and reliable partner, Germany. Last year, Germany bought slightly more than 40 billion cubic meters,” Miller added. 10:46 MSK:“We, Gazprom and Russia, have untapped the Asian gas market,” said Aleksey Miller, CEO of Gazprom. 10:45 MSK:“Resource opportunities in Russia are such that we can deliver both gas to Europe and Asia, and cover their demand. We are proud of the fact we have been reliable suppliers. This reputation has been forged over 40 years of reliable deliveries,” said Miller. “It’s obvious a market of 170 million is more advantageous than any of the member markets like Kazakhstan’s 17 million-strong market standing alone,” says Raimbek Batalov, chairman of Raimbek Group, a multi-industry holding company that sells juices and soft drinks. 10:30 MSK: “The European market lost in terms of competitiveness, and lost the competition for world Liquefied Natural Gas. Numbers that can illustrate the situation of the LNG market in Europe are scary. The load of LNG terminals is 100 million tons, only 22 percent of the total capacity. In 2003 the load of LNG was 90 percent. In 2013, Europe bought less LNG than they did in 2003,” Aleksey Miller, CEO of Gazprom, said. 10:27 MSK:“The Asia-Pacific is not only the largest and most dominant market, but it is the Asia-Pacific market that is influencing the European and North American market,” Aleksey Miller, CEO of Gazprom, said. 10:12 MSK:“These sanctions will not allow us to return to the way things were before. We were moving towards the open market, we removed trade and currency barriers, we thought we were in the middle of the process that would allow us to integrate into the global economy. We introduced Visa and MasterCard, and we thought we were on the way to the globalized economy. And all of a sudden, in a few weeks, we realized the global system we have built actually allows for the use of economic tools as a means of aggression against another state, not with a Kalashnikov rifle, but using the modern financial system,” Andrey Kostin, CEO of VTB Bank. 10:11 MSK:“US sanctions are a grave violation of any code of conduct in trade relations and I think they undermine the system of trust established over the last two decades,” Kostin said. 10:05 MSK: Iran, Russia, and Qatar top global gas reserves. Image from St. Petersburg International Economic Forum website. #Sberbank CEO #Herman Gref on #Russian payment system: "not replacement for visa and MasterCard in Russia, just much needed alternative"
9:40 MSK: Bob Dudley, CEO of BP, has arrived in St. Peterburg, ITAR-TASS reports. 9:14 MSK:“Why do we see enormous potential for us to work in Russia? Because of global demand for oil and gas. Demand will grow 5 percent through 2015, and 18 percent in terms of gas. We are sure the role of Russian oil and gas produced on land will grow and offshore will grow," said Vincenzo Petrone, president of Fincantieri, an Italian high-tech shipbuilding company. Petrone said four out six million potential offshore drilling points are "very promising" and that he expects Russia to raise its offshore share. 9:10 MSK: We are planning that our Russian and Italian colleagues will work together in building ‘New Moscow’, a new 1,490 sq km stretch of land that doubles the capital’s area. The territory to the southwest will house 1.5 million Muscovites, according to Sergey Cheremin, a Moscow Government Minister. 8:39 MSK: Vladimir Potemkin, deputy governor of the Kaluga Region, which is 150km southwest of Moscow, speaks on the public-private development of his administrative district. Over the past 10 years they have built 11 industrial parks which house 71 new plants, created 18,000 jobs and attracted $10 billion in direct investment. 8:21 MSK: Italy is ranked third among Russia’s European trading partners after Germany and the Netherlands, Dmitriev said. Over 500 Italian companies work in Russia. Forty-five years ago, Italy was the first country to import gas from the Soviet Union. 8:20 MSK: Even though some of Russia’s foreign partners refused to attend the Forum, there's plenty of business to be done with those who put politics aside, Joe Watt, Managing Partner at Ernst & Young CIS, told RT’s Marina Kosareva. 8:18 MSK: Vladimir Dmitriev, Chairman of Vnesheconombank, Russia’s state-owned foreign bank, gives the opening address at a business breakfast on Russian-Italian relations. Day 2 tomorrow at the St. Petersburg International Economic Forum. Gazprom CEO Aleksey Miller and Russia’s Energy Minister Aleksandr Novak will participate in the panel ‘The Changing Map for Global Gas’ at 9:45. Russian President Vladimir Putin is scheduled to present the 2014 International Global Energy Award at 13:15. Here is today’s schedule. All times listed are in Moscow Standard Time (MSK). 19:00 MSK: Capital outflow from Russia in the second, third, and fourth quarter of 2014 will be between $25-27 billion, about half of the $51 billion that leaked out in the first quarter, Economic Minister Aleksey Ulyukaev said at the forum. The overall forecast for 2014 capital outflow is $90 billion, by the minister's estimate. Ulyukaev attributes the unusually high outflow in Q1 to Russians transferring their savings into other currencies. In the next month Ulyukaev expects to see an inflow of foreign currency. 18:41 MSK: VTB, Russia's second largest bank by assets, increased its current loan portfolio by 10 percent in the first quarter of 2014, bank chief Herbert Moos said. Overall in 2013, the bank increased its loan portfolio by 24.5 percent. 18:45 MSK: The Kremlin may decrease its stake in Rosneft, Russia's largest oil company, by 19.5 percent by the end of this year, Economic Minister Aleksey Ulyukaev said. Previously 2015 and 2016 were reported, but the minister said this year is "technically possible." 18:27 MSK: Deputy Prime Minister Igor Shuvalov said that Russia will likely need to raise the retirement age in order to use money from the budget for infrastructure development. Shuvalov conceded this would be an unpopular decision. 18:15 MSK: Foreign investors at SPIEF say they won’t refuse partnerships with Russia and are ready for new projects - Deputy Prime Minister Igor Shuvalov. 17:42 MSK:“We’ve got very talented entrepreneurs and potential entrepreneurs But it is very difficult to start a new business because of the regulations that are there," says Dominic Barton, Managing Director at McKinsey & Company. “Two years ago if you visited the mayor of Beijing, and you went into his office you’d see three numbers. 36, 35, and six. I thought it was some new party manifesto that was going on. What it was; it takes 36 days to start a new business in Beijing, 35 in Shanghai, and 6 in Singapore, that’s what the mayor wanted people to see. I think we have to get some very granular comparisons on how quick it takes to build businesses, so we get real about where we are, and I think there is a lot of potential on the SME side,” says Dominic Barton, Managing Director at McKinsey & Company. 17:39 MSK:“I’m an optimist about what Russia can do, and I think that one thing is that it's obviously a tough situation, primarily from the growth, let alone the political crisis that is going on, and I would actually suggest that warrants a bit of a jolt. I don’t know 'steady as she goes' will do the Russian people any benefit in terms of the potential that is there, or the rest of the world, so I think it’s time to recharge and drive things,” says Dominic Barton, Managing Director at McKinsey & Company. SME is 21% of GDP, about a third of that in Germany. 17:37 MSK: “I’m an optimist and in the mortal world we can’t cooperate if there is no trust. The lack of trust will incur a lot of costs for any economy” – Sberbank CEO Herman Gref. 17:29 MSK:“I very much hope the political tensions will be solved within a fairly reasonable amount of time and sanctions are just temporary posturing that will not last. As for the recession, well you are in a recession, and its temporary, and that’s the nature of economics recessions follow years of fast growth,” Charles Wyplosz, Professor of International Economics at the Graduate Institute of International and Development Studies in Geneva, said. 17:20 MSK: Sberbank is about to finish up its panel session on how to make the Russian economy more competitive. Here is the bank's helicopter simulator on the expo floor. 17:11 MSK:“The most important thing is deregulation. After a nine year break from working in the government, I can see that regulatory pressure has improved dramatically. However, additional legal costs are still a burden for small and medium sized businesses. If you introduce a new regulation, you must abandon another regulatory requirement. One in, one out,” - Russia’s Economic Minister Ulyukaev Aleksey Ulyukaev. 17:11 MSK:“The most important thing is deregulation. After a nine year break from working in the government, I can see that regulatory pressure has improved dramatically. However, additional legal costs are still a burden for small and medium-sized businesses. If you introduce a new regulation, you must abandon another regulatory requirement. One in, one out,” Ulyukaev said. 16:59 MSK:“We need to switch from external lending sources and find internal resources. Economic growth we had before the crisis was based on the fact we were expecting oil revenues and we benefited from increasing prices, and that is why we had a strong currency and raised lending abroad by 70 percent. This model is not valid anymore, we will not achieve economic growth using the same structure, and we need to find internal lending sources, and for this we need to drastically change economic policy” - Sergey Glazyev, economic aide to President Putin. 16:31 MSK:“In order to be able to organize a loan you don’t have to reinvent the wheel, you can use the post-war European experience as a model - how they refinanced commercial banks. Or look at the Japanese experience which utilized lending solutions through development banks" - Sergey Glazyev, economic aide to President Putin. 16:30 MSK:“This is a paradox. The country currently has a $200 billion trade balance, and for a long time has been acting as a donor to the world economy, approximately $100 billion in annual transfers per year, and is not capable of organizing long-term credit”- Sergey Glazyev, economic aide to President Putin. 16:10 MSK: RT hosts 'Infowars: Who pays the price?' live discussion panel. 15:27 MSK: “I’m extremely positive about the opportunity in the Russian regions,” says David Gray, Managing Partner of PwC. “Realistically, we have stopped growing and we need to find new sources of growth. These sources are in the small and medium-size enterprises.” He added that too much competition from the state sector stifles potential and creates imbalances. 15:08 MSK: Finns remain positive towards investment in Russia. One out of every five investments in Russia comes from Finland. In northwestern Russia it is almost one in every four. Up to 12 billion euro so far, with the largest investor being Fortum, an energy company that serves Nordic countries, Mirja Tiri, CEO, Finnish-Russian Chamber of Commerce told Summit participants. 14:55 MSK: One third of the Russian population has no access to a bank, which is why the Russian Post Office proposes to establish payment systems at branches across the country. 14:45 MSK:"North America remains committed to the Russian market in the long-term" - Daniel Russell, President, US-Russia Business Council. 14:37 MSK“One of Russia’s main issues is liquidity and access to long-term funding, not helped, of course, by recent ups and downs in the ruble,” Roger Munnings, Chairman of the Russo-British Chamber of Commerce. 14:25 MSK: Deputy Prime Minister Igor Shuvalov is still on his way to SPIEF, has just landed at the airport in St. Petersburg. 14:08 MSK: The main task of Russia’s Ministry Finance is to continue Visa and MasterCard payments in Russia - Aleksey Moiseyev, Deputy Finance Minister. 14:07 MSK: The third session of the ‘Global CEO Summit” has begun. Discussions will be centered around the theme of increasing competitiveness. 14:02 MSK: The main task of Russia’s Finance Ministry is to continue Visa and MasterCard payments in Russia - Alexei Moiseev, Deputy Finance Minister. 13:45 MSK: One of the big deals already inked today is with IBM East Europe/Asia. The company will start a ‘smart city’ project monitoring transport and public utilities in St. Petersburg through 2030. 13:15 MSK: The second session of the panel finishes, and participants go for lunch. 13:07 MSK:“The government has a plan to “de-offshore” the Russian economy. There are a number of laws that need to be enacted to specify and define offshore jurisdictions.” says Russia’s Finance Minister Anton Siluanov. 12:59 MSK:“What are we doing here in Russia? Working with Russian companies to develop new technological projects for the benefit of all and bringing clients energy as cheaply as possible,” Christophe de Margerie, CEO of France’s Total SA said at the panel session. 12:44 MSK: The ruble is weakening which slows down Foreign Direct Investment (FDI) but Russia still had $12 billion of non-financial sector FDI in the first quarter of 2014, presidential aide Andrey Belousov said. “Over the last year we had a net inflow into Russia of $80 billion US dollars. If you take out the TNK-BP deal, this is still over $60 billion,” Belousov said. 12:40 MSK: In 2013, net inflow into Russia was $80 billion. If you take out the TNK-BP deal, this is still over $60 billion. 12:26 MSK:“Energy is the backbone of every developed society. We have invested 10 billion euros in Russia since we arrived in 2006.” - Jorgen Kildahl, Member of the Management Board, E.ON, Germany's utility group and the largest importer of Russian gas to Germany. 12:20 MSK:“It is the duty of the government to pursue a balanced investment policy to create conditions for business to work well,” Russia’s Economic Minister Ulyukaev said. 12:18 MSK: Russia’s Economic Minister Ulyukaev says Russia can overcome politically-motivated sanctions by offering lower risk to foreign investors. “What should our response be to the sanctions? It should be an economic response. It should be offering lower risk to investors. If we can do this, this is the appropriate response to any politically motivated actions,” Ulyukaev said. 12:14 MSK: METRO AG, one of the world’s largest retailers, has invested $2 billion in Russia and is confident this is only the beginning - Olaf Koch, Chair of the Management Board, METRO. 12:02 MSK:“Our experience in Russia has been a win-win,” Paul Rollinson, CEO of Kinross Gold Corporation, one of the world’s top 5 gold producers, said. Russia has vast mineral wealth, but is still under-explored. Much of the company’s operations are centered in Russia’s Far East. 11:50 MSK: Russia’s Finance Minister Anton Siluanov delivers his keynote speech at the 'Global CEO Summit'. He says that the government is aware of the uncertainties in the Russian economy, and is ready to tackle them. “In response to sanctions, I believe we should be strict with our Central Bank and government policy, and speed up structural reform," Siluanov said. 11:35 MSK: Panel sessions resume. Viktor Vekselberg President of Skolkovo Foundation moderates the second session. 11:20 MSK: First session wraps up, participants adjourn for a coffee break. 11:12 MSK:“Corruption is truly a global issue,” Ian Colebourne, Managing Partner, Financial Advisory Services, Deloitte CIS. Colebourne, who has been doing business in Russia long-term, said Deloitte CIS has seen an increase in Russia’s desire to better proactively address corruption and increase corporate governance. 11:00 MSK:“During a crisis it is important to use the resources of the state,” Vladimir Yankunin, head of Russian Railways said at the CEO Global Summit. Yakunin added that Russia’s geographical position makes it competitive in developing infrastructure. 10:50 MSK: The CEO of Russian steel and mining company Severstal says sanctions are harmful, not only for Russia, but for the global financial community. Company head Aleksey Mordashov says political differences should be solved through diplomacy, and not harm the economy. 10:45 MSK:“Gas is certainly an important fuel in Europe and will remain an important fuel in the future. It is important that gas remains competitive and we can adapt contracts,” says Jean-Francois Cirelli, Vice-Chairman and President of France’s GDF Suez. 10:38 MSK:"We must pursue green technologies, but we can't bring immature technologies to the market," Gazprom Neft Chairman Aleksandr Dyukov said. 10:18 MSK: Ulyukayev wishes participants an enjoyable time at summit, and in the future hopes the forum will not be tainted by politics. 10:16 MSK: Ulyukayev says inflation will decrease to 6 percent, with the help of Russia's Central Bank, and government policy such as utility tariff freezes. 10:08 MSK: Aleksey Ulyukayev, Russia's Economic Development Minister says Russia's current growth forecast is 0.5 percent for 2014. Ulyukayev believes oil prices will not grow and will either stabilize or decrease in the near future. 9:34 MSK: The first session of the 'CEO Global Summit' has began. The session is being moderated by Dr. Hans-Paul Buerkner, Chairman of The Boston Consulting Group and Aleksandr Shokhin President of the Russian Union of Industrialists and Entrepreneurs. VTB Bank’s head Andrey Kostin and Russian Railways Vladimir Yakunin will be present, as well as Deloitte’s Managing Partner Ian Colebourne and Ernst & Young’s Managing Partner Mark Otty. 9:30 MSK: RT is at SPIEF and ready to go! Here’s the schedule for the 1st day at the Economic Forum in St. Petersburg. Check out the official forum website for live broadcasts. All times listed are in Moscow Standard Time (MSK). 14:00—15:15: What Steps are Needed to Bring Russia’s Stalled Economy to a New Phase of Sustained Growth? 14:00—14:45: Not Wasting a Crisis: What (Should) We Have Learned to Better Manage the Global Economy? 16:00—17:30: Infowars: Who Pays the Price?